This listing is for a left and right Antique Brown Oak Leaf Leather saddle bag. They fit 2015 to 2018 Indian Scout. The entire Bag is made of Heavy Top Grain Veg Tanned Leather.The Sides of the bag are Reinforced with a second layer of leather that help the bag keep it's shape. The bag is attached with a steel mounting plate and is bolted to the fender. All of the necessary mounting hardware is included. This bag can be made in any any of the other leathers found in my store. You can have it made to match your seat. The bag is 4" front to back, 15 1/2" wide and 12" tall. 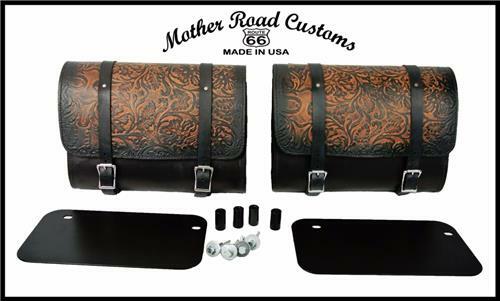 You can now have a Saddle bag made to match almost any seat that you would like to buy from Mother Road Customs. We use only high quality, long lasting, materials. We can make this bag to match almost any of my seats. We also have matching seat, passenger pads and tool bags.